Scarlet Witch has joined the arena and is now available on Marvel Contest of Champions. You can win a 3* version of the character by competing in the Warped Reality arena, while a 4* champion can be won in the Chaos Magic arena. 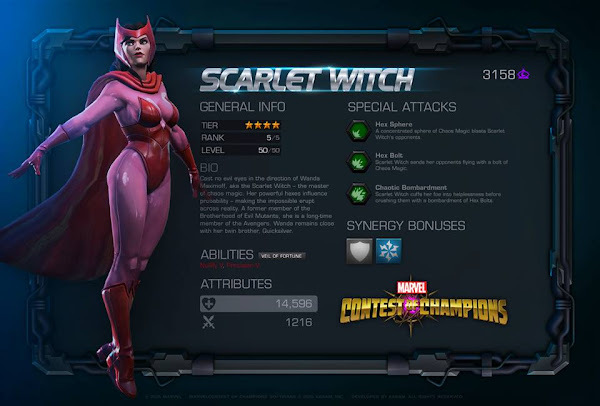 The Scarlet Witch (Wanda Maximoff) is a mutant, born with the ability to alter reality in unspecific ways. Historically, she is the twin sister of Quicksilver as well as the daughter of Magneto and the paternal half-sister of Polaris. However, she and her twin brother were later retconned, to be the children of Django and Marya Maximoff who were kidnapped and experimented on by the High Evolutionary. After a failed experimentation that gave Wanda her power, the High Evolutionary returned them to their parents and grew up believing that they are common mutants.